A bouquet of flowers picked along the way …. A couple weeks ago we had our second couchsurfing experience and just like the first one, it left behind positive vibes. However, unlike the first one, this time we were the hosts. For the uninitiated, couchsurfing is a social network where you get a couch and give a couch. A couch implying a place to park your belongings and sleep. So, basically, you’d either end up sleeping in a stranger’s house or have a stranger sleep in yours. The idea sounds a bit crazy given the *mad about security* times that we live in. On a closer look, it isn’t as mad as it sounds. Couch surfers have profiles, they get recommendations, and give recommendations. And thus, there is a system of trust built around your history as a couchsurfer. Other obvious rules apply, such as, it is better to have a well written profile with reassuring descriptions and pictures. The first time we couchsurfed was during our visit to Washington, DC in 2011. Recall, I am a PhD student with a family. That is just a sophisticated way of saying I cannot afford a vacation without collateral damage to other monthly necessities. In comes couchsurfing, where I’ve been a member for years but never really participated. Within no time we found a “couch” which was actually a small apartment all to ourselves. 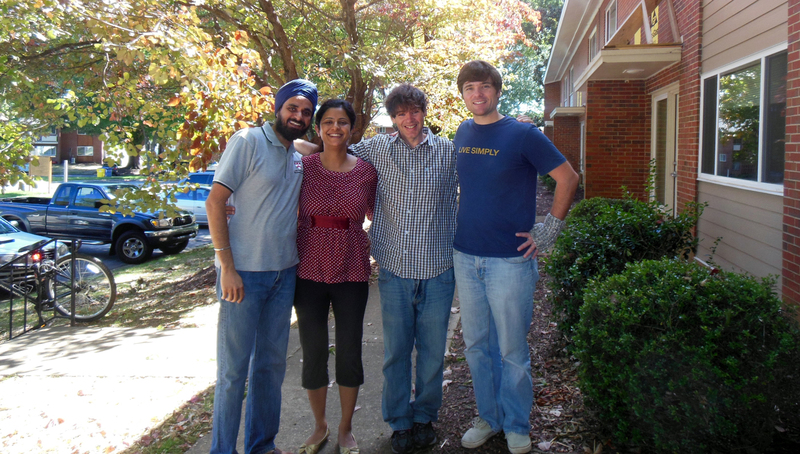 Our host, George, gave us the keys to his apartment and went to live in his mother’s home a couple blocks away. His mother was on vacation in Europe. Unbelievable. We’ve only known George during our search for a couch. So, here’s a guy who is ready to trust not just his space, but his complete house to strangers. The risk is not always monetary, but it is there. A more real challenge is having to cope with the idea that you have to share your space with strangers. What if they are untidy but you are a clean freak. How about loud versus quiet? George underlined my believe that humans have a lot to celebrate for. And it is okay to trust. Which we did when we hosted The Wilhelm Brothers, a two member folk rock band based out of Ashvelle, NC. It was a short one night stay and we wish they could have stayed for another day. I hardly got half as many stories out of them as I wanted to 🙂 But they were on tour for their new album, Lay Your burden Down. Both Cristoff and Chris were easy going, polite, and clean. We hope they had a comfortable stay and will visit us again. The benefits greatly outweigh the risks. The stories you hear and the experiences you collect can be transformational, create lasting memories, or at least make good coffee table cpnversations. If you enjoy human connections, seek strangers. I am inclined to say we’ve tasted both sides of the couchsurfing cake and “We’r Lovin’ It”.